They collaborated on a few tracks going to open mic’s around Bristol, even performing some songs together. In January 2015 they decided to form This Human Condition encouraged by peoples feedback saying they worked well together. THC have gained support from Tom Robinson and been introduced on BBC Introducing playing Rise on his BBC 6Music show and including it on his Personal favourites Mixtape. Rusty Egan had played Brother Blue & Telepathic Heights on his “Electronic Family Tree” show. Scottish DJ & Journilist Jim Gellatly played Telepathic Heights on his New & Emerging show on Amazing Radio. ​Local Radio stations – BCfm ran an hour long show on their prime time Saturday night show “Streetmaps” interviewing THC and playing 5 tracks from the band and talking to them about their music for an hour. Phil Hodgson from Apple fm has supported THC and played several songs. Steve Parkhouse of Jelli Records has played THC on his show several times, that show goes out on BSRfm, Somer Valley fm, Wire Radio & Longside Radio. 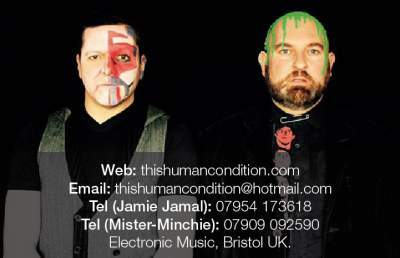 ​Bristol Music show (BMS) played the Psychotropic video on their first series on Made in Bristol TV. Revival Synth have featured Brother Blue and Telepathic Heights on their weekly top 5 list. Plus links to the Video for Telepathic Heights on their front page. THC were asked to support Justin Utley for a Bristol Pride fundraiser in April 2016 and helped raise money for Pride 2016. THC have played Bristol stages such as The Lousiania, The Fleece, The Bierkeller, and headlined for the Trans/forms event in Hamilton House in Bristol’s Trendy Stokes Croft. THC are currently in talks about putting on some future gigs.